Accuweigh’s QWM branch recently supplied a modular weighbridge for weighing shipping containers prior to loading onto small “island hopper” ships that distribute freight to the smaller ports in the Solomon Islands. Accuweigh’s modular weighbridge is fully galvanised and manufactured in steel for easy removal and relocation if and when the need arises. 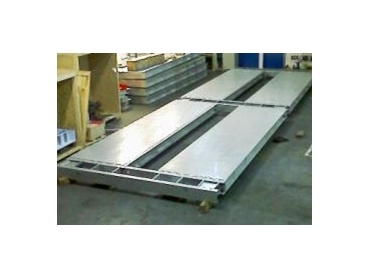 A unique feature of Accuweigh’s modular weighbridge uses the centre load cells as the joining section between each pair of mating weighbridge decks which greatly reduces deflection of the weighbridge deck under heavy loads. The shipping containers will be weighed on this modular weighbridge to allow ship loading personnel to better manage the positioning of the shipping containers for increased ship stability by eliminating unbalanced loadings. Accuweigh’s portable weighbridges utilise five metre weighbridge deck sections connected in any number to provide the required weighbridge length. These portable weighbridges carry full trade approvals in Australia and due to the all metal construction offer greatly reduced installation costs compared to concrete deck weighbridges. Accuweigh is an Australian industrial weighing company with branches in all states and has installed more weighbridges than any other weighbridge supplier.